刘佳林, 秦明宽, 蔡煜琦, 徐浩, 张闯, 庞雅庆, 田建吉. 粤北诸广山岩体南部长排矿区流体包裹体研究[J]. 地质通报, 2019, 38(2-3): 388-396. Liu J L, Qin M K, Cai Y Q, Xu H, Zhang C, Pang Y Q, Tian J J. Fluid inclusion studies of the Changpai area in Zhuguang Mountain, northern Guangdong Province[J]. 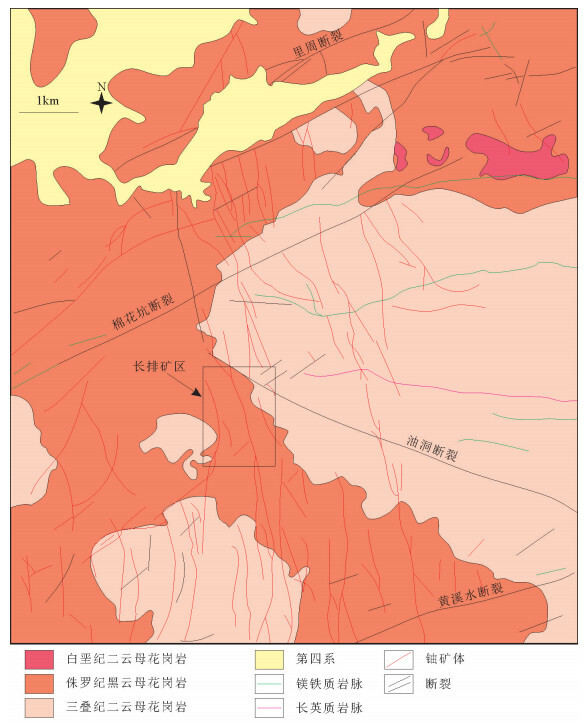 Geological Bulletin of China, 2019, 38(2-3): 388-396. Abstract: The Changpai area, located within the southern part of the Zhuguang Mountain, is an important prospecting area in South China. In this paper, the authors present new fluid inclusion and stable isotopic data of the study area to discuss the nature of the oreforming fluids and uranium mineralization. Two types of fluid inclusions of the mineralization stage were recognized by petrographic observations:three-phase CO2-rich (type Ⅰ) and two-phase vapor-liquid (type Ⅱ) fluid inclusions. Type Ⅱ fluid inclusions include two sub-types, i.e. liquid-rich (type Ⅱ-1) and vapor-rich (type Ⅱ-2). 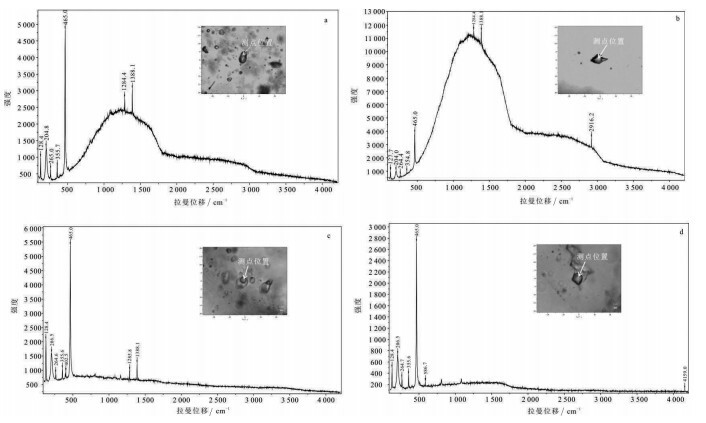 Based on petrographic features and the results of microthermometry, the fluid inclusions from the mineralization stage can be classified into two suites:(1) type Ⅰ and Ⅱ-2 fluid inclusions with homogenization temperatures of 291~388℃ and salinities of 3.23%~7.87% NaCl equivalent; (2) type Ⅱ-1 fluid inclusions with homogenization temperatures of 140~260℃ and salinities of 1.74%~10.24% NaCl equivalent. The fluid inclusions of suite 1 and 2 represent the early and late sub-stages of fluids during the mineralization stage, respectively. 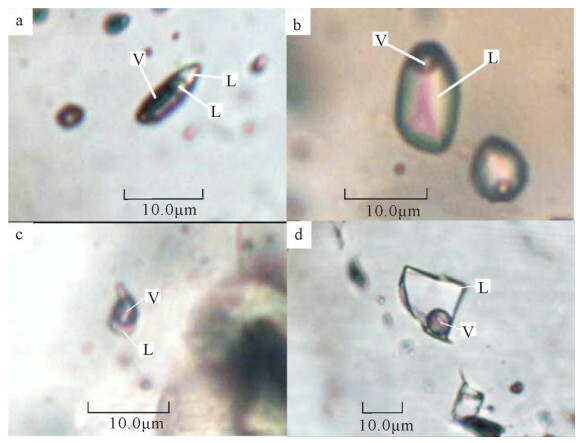 Raman analyses of fluid inclusions show that the vapor ingredient of the ore-forming fluid inclusions contains CO 2, CH4 and H2. 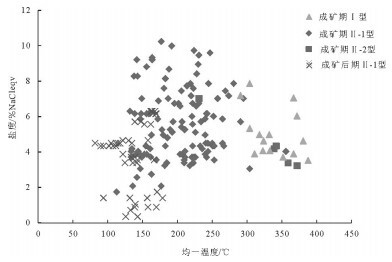 S isotopic compositions (δ34S=-10.2‰~-3.2‰) of the pyrites associated uranium mineralization are similar to those from other U deposits in South China. The fluid inclusions of suite 2 are characterized by wide range of salinities and have lower homogenization temperatures than those of suite 1, indicating that fluid mixing process took place. Combined with geological features, the authors hold that U was derived from the granite which was associated with partial melting of uranium-rich ancient crust, and that temperatures declining and fluid mixing played a key role in U precipitation. 陈振宇, 黄国龙, 朱捌, 等. 南岭地区花岗岩型铀矿的特征及其成矿专属性[J]. 大地构造与成矿学, 2014, 38(2): 264-275. 胡瑞忠. 花岗岩型铀矿床成因讨论——以华南为例[J]. 地球科学进展, 1994, 9(2): 41-46. 胡瑞忠, 李朝阳, 倪师军, 等. 华南花岗岩型铀矿床成矿热液中ΣCO2来源研究[J]. 中国科学(B辑), 1993, 23(2): 189-196. 凌洪飞. 论花岗岩型铀矿床热液来源——来自氧逸度条件的制约[J]. 地质论评, 2011, 57(2): 193-206. 秦明宽, 何中波, 刘章月, 等. 准噶尔盆地砂岩型铀矿成矿环境与找矿方研究[J]. 地质论评, 2017, 63(5): 1255-1269. 蔡煜琦, 徐浩, 郭庆银, 等. 江西省桃山地区花岗岩型铀矿预测及找矿方向[J]. 吉林大学学报(地球科学版), 2013, 43(4): 1283-1291. 黄国龙, 刘鑫扬, 孙立强, 等. 粤北长江岩体的锆石U-Pb定年、地球化学特征及其成因研究[J]. 地质学报, 2014, 88(5): 836-849. 范洪海, 陈金勇, 顾大钊, 等. 纳米比亚欢乐谷地区白岗岩型铀矿床流体包裹体特征及成矿作用[J]. 矿床地质, 2015, 34(1): 189-199. 陈辉, 倪培, 陈仁义, 等. 浙江建德铜矿流体包裹体研究[J]. 高校地质学报, 2016, 22(1): 1-11. 姚磊, 吕志成, 陈辉, 等. 再谈矿山深部及外围找矿新发现及意义[J]. 南京大学学报(自然科学), 2018, 54(2): 296-307. 邓平, 任纪舜, 凌洪飞, 等. 诸广山南体印支期花岗岩的SHRIMP锆石U-Pb年龄及其构造意义[J]. 科学通报, 2012, 57(14): 1231-1241. Zhang C, Cai Y Q, Xu H, et al. Mechanism of mineralization in the Changjiang uranium ore field, South China:Evidence from fluid inclusions, hydrothermal alteration, and H-O isotopes[J]. Ore Geology Reviews, 2017, 86: 255-253. Sergeyeva E I, Nikitin A A, Khodakovsky I L, et al. Experimental investingation of equilibria in the system UO3-CO2-H2O in 25℃-200℃ temperature interval[J]. Geochemistry International, 1972, 9: 900-910. 赵斌, 王声远, 吴厚泽, 等. 高温高压实验地球化学[M]. 北京: 科学出版社, 1995: 142-166. 张祖还, 章邦桐, 等. 华南产铀花岗岩及有关铀矿床研究[M]. 北京: 原子能出版社, 1991. 何德宝, 范洪海, 孟艳宁, 等. 粤北下庄铀矿田不同类型矿床成矿流体对比研究[J]. 地质与勘探, 2015, 51(2): 303-311. 章邦桐, 张祖还, 凌洪飞, 等. 华南东部铀成矿作用与陆壳演化的关系及其远景分析[J]. 核科学与工程, 1994, 14(2): 157-164. 凌洪飞, 沈渭洲, 邓平, 等. 粤北帽峰花岗岩体地球化学特征及成因研究[J]. 岩石学报, 2005, 21(3): 677-687. 刘继顺, 章邦桐. 华南陆壳铀地球化学演化与成矿[J]. 华东地质学院学报, 1992, 15(2): 130-135. 孙涛, 周新民, 陈培荣, 等. 南岭东段中生代强过铝花岗岩成因及大地构造意义[J]. 中国科学(D辑), 2003, 33(12): 1209-1218.